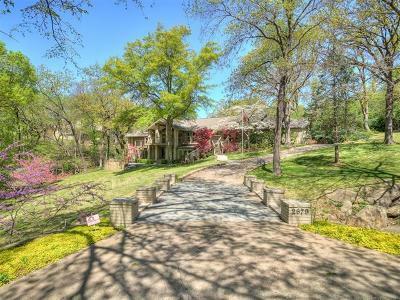 This 1 acre lot sits in the center of Tulsa w/views overlooking the towering trees & lush landscaping. Designed with entertaining in mind, home has several indoor & outdoor living areas. The dramatic entry is open to spacious great room w/FP, wet bar, formal & causal dining & an office w/built in's. The walkout game room has wet bar, gas FP & patio w/trex decking, and fire pit. The master suite has breathtaking views, gas fireplace, dual vanities, dual closets, soaking tub, and a large frame-less shower.